Service engineer (Electrical) Newport £31500 + £2K bonus + Van (All fuel paid including for personal use) Mobile, Tablet, Pension, Holidays, and lots more. OT and on call 1 weekend in 3 paid at time and a half and double pay. Most electricians comfortably take home £40K+ for a very comfortable working week. Why should you apply? Are you an electrician/ field service engineer, who would like to work for one of the best companies in the UK? £31500 + £2K bonus + Van (All fuel paid including for personal use) Mobile, Tablet, Pension, Holidays, and lots more. OT and on call 1 weekend in 3 paid at time and a half and double pay. Most electricians comfortably take home £40K+ for a very comfortable working week. Full and continuous training is provided throughout your career with the company. Are you an electrician/ field service engineer, who would like to work for one of the best companies in the UK? You will receive lots of training, support & friendship. Most of the engineering team believe it's the best company they've ever worked for. Roles only come up very rarely due to a low turnover of staff. So if you are considering a move please apply and we will be in touch to tell you more. As an electrician/ field service engineer you will be working in the Newport, Cardiff, Swansea and surrounding areas. You will be installing, servicing and repairing the highest spec industrial/commercial kitchenware and sterilisation equipment. These machines are not white boxes but high tech modular units up to large scale production lines. You will receive extensive training and guidance in the early part of the role and support while on site to ensure you can resolve most issues. The training is onsite, shadowing other engineers and at the specially build training centre in Slough. Your end goal will be to take ownership for your region and build trustful relationships with your customers. Customers range from the fire brigade, hospitals, airports, universities, hotels, restaurants and bars. As the equipment advances you will need to continue to train so must be very open to learning new skills. You will need to be an electrician or come from an electrical background! Any mechanical or plumbing skills would also be useful. The electrics is a must have as this would take too long to teach, so if you have testing and inspecting, 17th edition, C&G or an apprenticeship you are half way there. Secondly you will need to enjoy working in the field. Some of the time you will team up with other engineers for big installations or repairs but a vast majority of the time you will be out by yourself, once training is complete. You will be in daily contact with your call handler and colleagues but you will be working by yourself a large majority of the time. You must live close to Newport as although you will be covering South Wales there are some key customers in this area. Finally you must take pride in your work, be keen to lean and enjoy talking and building friendships. The company pride themselves on never losing customers. This is down to the technical capabilities and personalities of the engineers, who offer a smile and a chat as they go. Basic starting salary is £31500 but you will receive an additional bonus of £2000 paid quarterly. You get a brand new van including fuel card for personal use. You earn extra from completing overtime (1.5x & 2x and being on call one weekend in three up to 17.00pm. Most engineers in their first year take home around £40K for a comfortable working week. You can earn more elsewhere but the work life balance and environment you will work in is unlikely to be matched. You also get a Pension, holidays and loads of kit. If you have some questions you'd like to discuss before applying please get in touch and I'd be happy to talk them through. We do try to get back to everyone within 14 days of application, if we fail to do so please get in touch and we will update you with a progress report. We also run a referral scheme so if you want to recommend a friend please do so. For every successful candidate we placed we pay out a reward of £250. 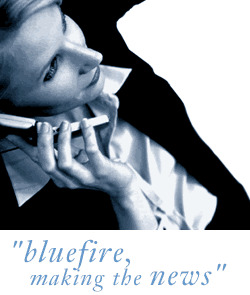 Bluefire Recruitment is an employment agency acting on behalf of the client company.